Switzerland is a weird country. A few examples? In the case of nuclear war, the Swiss have bunkers capable of fitting more than 100% of the country’s population – it is the only (paranoid enough) country to be capable of doing that. Swiss highways can be converted into runways by quickly removing the grade separations in between the lanes. Switzerland also has ad-hoc airbases with hangars carved out of the mountains. And the Swiss Air Force has office hours – yes, office hours. So despite all the „heavy armour“ around – just invade at night time and Swiss Air Force pilots are in bed. And due to the noise level which could hurt important Alpine tourist region – Swiss pilots have to go abroad to fly supersonic (and are not flying at all in the mountains during tourist season). I was driving through Switzerland years ago, when I discovered a fighter jet taxiing out of a mountainside and finally take off on a nearby landing strip. Switzerland is neutral, but has one of the largest armies on a per capita basis and all militia soldiers take their guns home – one could say Switzerland has an almost national paranoia about defence. Where does this come from? Historically, it stems from the fact that Switzerland is at the crossroads of important routes through the Alps – critical for any emperor. During the Cold War, the Swiss built a giant militia-based national defence system that rivals that of any country in the world. If anyone were to invade Switzerland, they would find a nation armed to the teeth. Switzerland has a national building code that requires every home to either have a bunker or pay into a fund to maintain community bunkers – so every Swiss Citizen has quick access to a shelter. The Swiss Army maintains a defence network of huge fortified cannon placements – some of them well able to attack an approaching enemy well beyond the Swiss border. 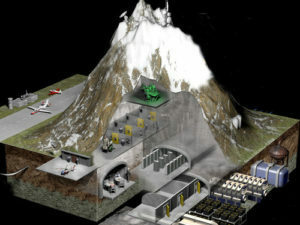 Switzerland has countless mountain bunkers – Swiss mountains are like cheese, countless holes are drilled inside – one of them being a big bunker with a small train, for the Swiss government. Cannon placements are extremely well hidden, and you can imagine it would be a nasty surprise for an invader to be in the firing range of one of those cannons. Are you sure I’m a rock? The Swiss army also had countless fake rocks, houses or barns that could open a whole wall or split into two, with cannons and/or nasty machine guns inside. Many of those were given up recently, and even Swiss citizens were surprised how well guarded they were. Also, thousands of Swiss tunnels and bridges, but also highways and railroads are built with tank traps and demolition charges. When we used to visit Switzerland we had a game as we drove along or walked the mountain paths – „Spot the hidden bunker„. The more you looked, the more you saw. Switzerland is riddled with hidden and disguised military installations. 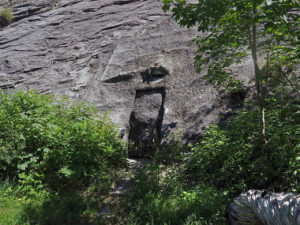 What appeared to be a rock face in a lay-by beside the road were actually steel and concrete doors painted like rock. That 4 lane highway actually converts to a runway with the hangar doors hidden in the cliffs beside it. The cute looking little chocolate box mountain chalet you are hiking towards has machine gun slits on closer inspection. 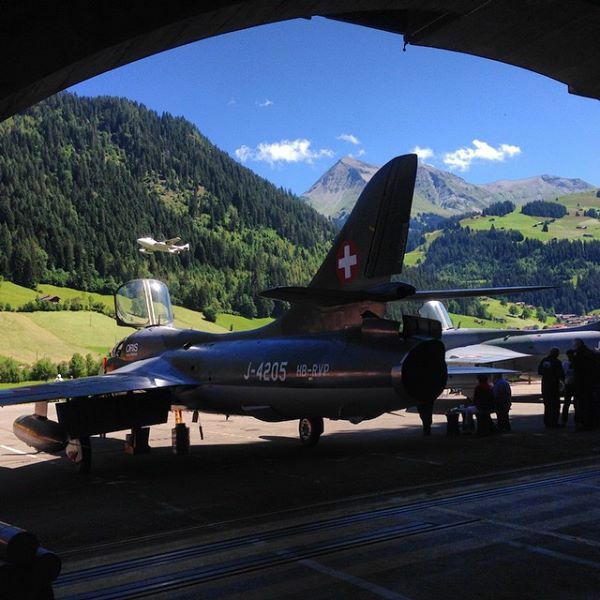 The Swiss maintain a small air force. That wasn’t always like that, it once had a huge Vampire and Venom fleet, with only the married pilots having ejection seats. Nowadays, Switzerland has 32 Boeing F/A-18 Hornets (initially 34) and 54 F-5E Tiger (to be replaced by 2016 – but Switzerland voted against the purchase of Saab JAS-39 Gripen in a popular vote in 2014). By the way – even the Swiss Air Force pilots where militiamen except the F/A-18 pilots who are professionals – Most of the militia pilots are Civilian pilots outside the Swiss Air Force, but some of them farmers or butchers. While small, the Swiss Air Force is also very secretive. Alongside their (countless) mountain air bases are hardened tunnels drilled into the mountains – where the fighter jets are being kept. If enemy pilots would be flying overhead, all they would see is taxiways disappearing into the mountains. And there is the rumour that even runways are vanishing in the mountains – with only a small part being visible. 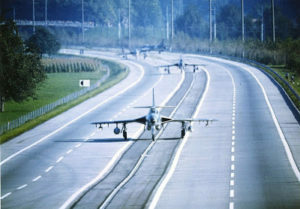 The Swiss Air Force also has highways parts that can be converted into landing/takeoff runways by quickly removing the grade separations – and from time to time exercises do take place on those parts. Usually, at night time, highways are closed down so the fighter jets could land. How the hell do they find their way? Another remarkable thing is how Swiss military pilots managed to fly within the Swiss Alps – without ILS and GPS, of course. And they didn’t just fly at good weather! First of all, as a Swiss pilot, you know the geography extremely well. But when the weather was bad, we were guided from ground stations who told us exactly where to fly, how many degrees to the left, when to go up, when to go down. It was an extreme level of trust as we sometimes didn’t see anything while flying through a narrow valley at low level. A simple system, but it worked. The customer then asked: Well it works for Switzerland, but how do Swiss pilots manage the orientation abroad? We do not invade, so why do pilots have to manage navigation abroad? I got the privilege while living in Switzerland to witness in person hangar doors opening from a green covered mountain and watching 11 jets sortie. By far one of the best days of my life in terms of life experience. I wanted nothing other than to be flying along side them through the beautiful countryside. I have always said that the Swiss are the only people who are the government, military, and police of their own nation and it is amazing how there is no disconnect between the citizens and their forces. Together they are united more strongly than any nation I have been to, researched, or lived in. The Swiss are to be commended for their recalcitrance of big government and their steadfast loyalty to their citizens as they are truly a nation of one. Dying to see this. Can you give me any idea of where it is? Switzerland is a total mess now. It’s like a first class jail. Switzerland is the „European Singapore“… The billionaires have destroyed this country a long time ago, have let in millions of migrants who couldn’t care less about Switzerland. It has one of the highest rates of foreigners in the world. Most citizens live in apartments from birth til they reach retirement age and then they get discarded into aged care homes. Most never have a chance to own their own piece of land. Families are VERY VERY WEAK. Swiss are all just tools of the government/elite. Government power is VERY BIG and family power is VERY SMALL. Feminism is HUGE and the men are powerless. Most men are just powerless workers. Landless, renting, without any say. Switzerland is also home to a lot of evil globalist corporations, Nestle, Syngenta, Novartis, Roche, all the banks, just to name a few….Every little thing is registered, monitored and taxed. The Swiss people are not free, trust me, I grew up there and lived there for 25 years. They are among the most enslaved people on Earth. And some of the most brainwashed too… Many people living in the countryside in second and third world nations enjoy more freedom than the Swiss. I have to disagree with this rubbish comment. We have one of the best political system in the world called direct democracy. I grew up in Switzerland and have traveled the world extensively also lived for years in Australia. We have some of the lowest interest rates in the world and just because you didn’t safe enough money to buy your own house doesn’t mean we are all enslaved people. I’m guessing your are just one of those people that have never left the country and complain about everything. There are millions of people in the world that would be happy live in place like Switzerland with things like: excellent social security, low income tax rates etc. Go and see they world that might open your mind and your narrow view. thought you too hit the nail on the head with your point of view. I too escaped that jail 43 years ago and am glad I did. I would not like to grow old there with the inhuman bureaucratic nonsense enshrined in law that robbs nursing home inmates and their families of all assests to feed the insatiable hunger of state coffers. and soon after in history turned into tyrants themselves. corruption runs high on all levels of government but is camouflaged to Swiss Perfection for few to see. no one there gets tortured to death literally nor is left to starve unlike in other countries of the world. The public transport system in place is admirable, law and order pervails and the remaining ecology of the land is well managed with recyling of waste at at very high level. All that with a rising popualtion now at the edge of practicality! Talk about a leftist, you’re so one-sided. Yes, the feminism is excessive and extreme; yes, families are powerless and the government is as overpowered as TSM ZeRo; but nothing else. „Many people living in the countryside in second and third world nations enjoy more freedom than the Swiss.“ is a misconception at best and complete propaganda at worst. Try living as a child factory worker in China or India, a civilian in North Korea, in almost any Middle Eastern country, just to name a few. People might be locked down by the government and the economy, but the government isn’t indiscriminately killing off its nation. It is a honor to have the opportunity of learning more about a the only Country in the world that is Solid and Bonded together, just an example of how it should be always.